Designed for everyday use, the Sceptre C278W-1920R Monitor throws in a raft of features to handle tasks for the budget-minded consumer. It is an outstanding deal if you’re in the market for a large curved screen and don’t want to spend a bundle. 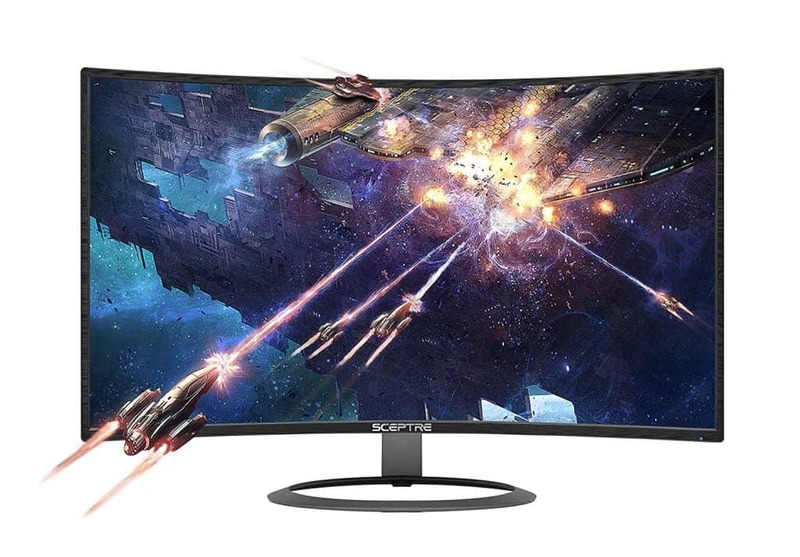 The Sceptre C278W-1920R has a budget price tag, remarkable sleek design, a modest assortment of ports, an average 60Hz refresh rate, and a curved screen for an immersive viewing experience. Although the monitor does lack some special features that exempt it from being a gaming capable (Adaptive-Sync, blazing refresh rate) monitor, it still has enough features to make it a great productivity machine for day-to-day tasks. If you are on a budget and want to squeeze every little hint of value out of your hard earned money, then the Sceptre C278W-1920R is a choice to really consider. When I first wrote about Sceptre, I was certain most people had not heard about it. That’s relating to my circle of friends and work colleagues Well, it’s no surprise. That’s the case with most people, or at least it was. Interestingly enough, Sceptre has been around since 1984. That tells you how hard it is to get your brand known out there in such a competitive world. I like underdogs because they strive to beat the odds. And more often than not, they go the extra mile to beat the main competitors. Despite the fact the Sceptre is not as yet a household name, they have risen to become among the best manufacturers of the budget monitor. As a matter of fact, some of their products are just as good if not better than what you get with bigger brands. So you can take a breath of relief now. 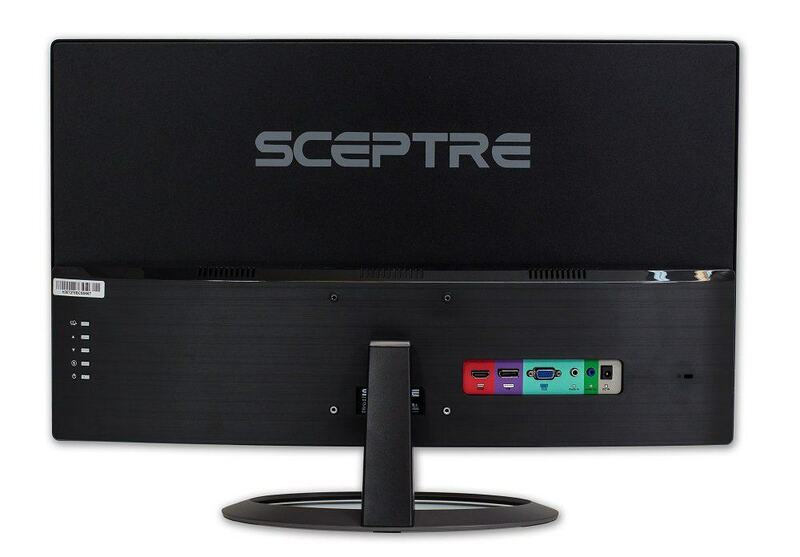 The Sceptre C278W-1902R is among the few monitors we’ve reviewed in the past year. And it flaunts of an attractive build and remarkable performance for its price. We fell in love with the sleek aesthetics and subtly curved screen (1800R curvature). Its case is made of all-matte-black metal and plastic on the bezel section. The corners are almost edgeless which gives it a sleek and premium look. The screen is surrounded by a thin strip, half an inch wide on the left and right sides and also including the top side. The bottom panel is slightly different with a 0.7-inch border running making it slightly broader than the rest. At 24.3 x 8 x 16.8 inches the Sceptre sits squarely in the realm of other monitors of its kind. 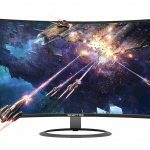 It shares almost the same dimensions with Samsung’s C27F398 27″ Curved Monitor (24.52 x 9.55 x 18.35 in) but relatively larger footprint than HP’s VH240a IPS monitor (8.58 x 21.22 x 19.65 inches). This 8.5-pound friendly beast stands on an oval shaped base plate with a short arm connecting it to the back of the monitor. Its back features a 100 x 100mm VESA mount pattern drill holes for possible wall mounting. You’ll need some washers before you order this unit. So a little heads up before you go out and purchase this unit. 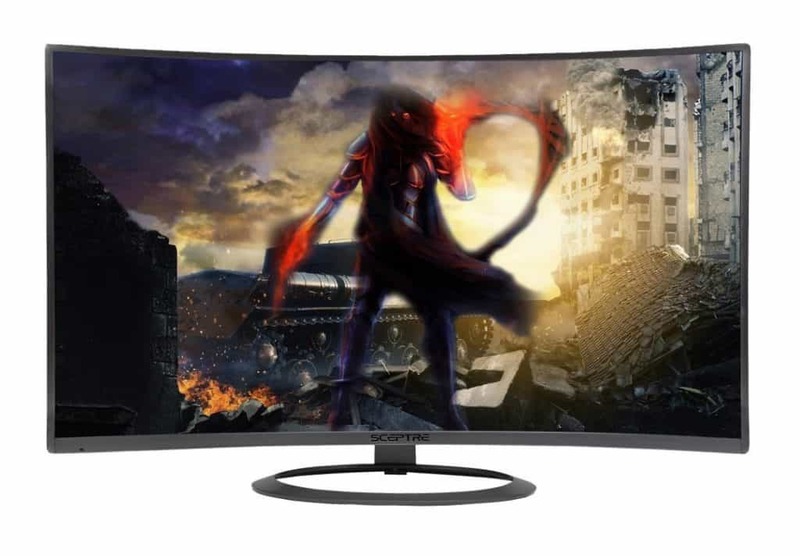 Related: Sceptre C328W-1920R Curved Monitor a larger version of our unit Sceptre C278W-1920R. Smack between the drill holes is the shoulder where the arm connects to the monitor. That makes it very hard to wall mount the display since this shoulder stands in the way, and most screws aren’t long enough to fasten the wall mount to the display. With that said, you have two option. First, can use the monitor on its regular stand or second, get your hands dirty with a set of longer screws and washers and mount it on the wall. If you are a little creative, this won’t be a problem. You can go for the PERLESMITH Universal TV Mounting Hardware set of source a few long screws at your local store for that. M8’s may likely get the job done depending on the wall mount handle you choose. Coming to the stand, the Sceptre C278W-1920R is supported by an oval-shaped base plate. This stand is quite sturdy and supports the display quite well without much wobble. The stand offers tilt freedom of up to 20 degrees: 15˚ backward and 5˚forward. Unfortunately, pivot, height, and swivel adjustments are not supported. While these adjustments would have been great to have, it will be unfair to bash Sceptre over this. Most monitors at this price point and higher come with similar stands. The bright side is that you still have the option for desk or wall mounting. The Sceptre’s input port selection includes an HDMI port (Red color code), a DisplayPort (Purple color code -DPI), VGA (Blue) and 3.5 mm Mini-Jack. It’s great having a DisplayPort as they are rarities in budget-priced monitors. The ports should allow easy connections to your mainstream desktop or extra monitor setup. We noted, however, that it does not include a USB port that could be used for connecting to flash drives or phones. That could easily be a problem for some. Physical controls are made up of four tiny control buttons located at the rear of the monitor. The buttons are vertically arranged along the bottom right-hand edge. Most gaming monitors have a mini-joystick at the bottom section of the lower bezel. The Sceptre doesn’t, but you can always use the buttons to get to the On Screen Display (OSD). The buttons let you get access to the picture mode (among the ECO, Backlight level, Contrast Level, DCR, Brightness, and Aspect Ratio) as well as four other user modes (Display, Advanced Color, Source, and Other Settings). The Display mode, for instance, lets you adjust values like color, clock, sharpness among others. Meanwhile, the Advance Color function allows you to adjust values like cool, normal, warm colors, SRGB for color balance among others. Check the manual for more OSD menu options. The Sceptre C278W pulls all the stops in the pursuit of the best mainstream experience possible. First, the panel comes in a subtle curved 1800R curvature which is reminiscent of other premium monitors like the Samsung CHG70. The high curvature provides an immersive viewing experience that is both great for the naked eye and multimedia. The C27W also enjoys a 5ms (gray-to-gray) response time, 1920-by-1080 native resolution, with 220 cd/m2 peak brightness and a 60Hz refresh rate. While 5ms isn’t considered much for gaming (1ms is best for intense gaming), it promises a better and smoother image. If you have to game, some simple gameplay of shooter games and racing will play well with this response time. Moving on to the brightness level, this Sceptre’s 220cd/m2 level is bright enough to make the picture noticeable for normal indoor use. However, the monitor might not thrive very well in dimly lit rooms. That said, considering you’re not planning to use it out outside, you should be fine at the end of the day. Further, the Sceptre C278W-1920R has a 5ms response time. For the most part, 5ms response is fast enough to handle most tasks and video without any noticeable motion blur, with the exception of very fast paced triple-A games. However, if you are looking for a monitor that will be best suited to handle games, you may consider the Asus VG245H 24 inch Monitor. With a 1ms response time, refresh rate of 75Hz, Adaptive-sync (FreeSnyc) technology screen tearing is an unlikely occurrence unless you are playing some crazy AAA title games. Today’s monitor options offer anything from 60Hz, 75Hz all the way to 144Hz. Because the refresh rate is one of the biggest selling points for manufacturers, it somehow is also the most confused. Our unit comes with a standard 60Hz (relatively average for monitors) which means it reduces blur during fast-moving motion images come along. You also get a Full HD (1920 x 1080) display which means you can stream videos on 1080p. Bottoms line, if you come in with the right understanding of what you are purchasing and what to expect, you will not be disappointed with the Sceptre C278W-1920R. It all depends on what you want to do with the monitor. If you plan to use it for productivity purposes such as reading, browsing the web, watching movies, some little gaming, etc, you will find the Sceptre C278W-1920R quite pleasant, especially considering the large screen area at your disposal. However, if you need sharp images and exact color matching such as photo and video editors require, you may best look elsewhere. As mentioned earlier, color reproduction is quite good. This we owe to the SPVA panel that makes the Sceptre C278W-1920R possible. You probably know about IPS panels and TN panels, but may not have heard of VA panels. TN panels off faster response time than the other two bots are the weakest when it comes to color accuracy and viewing angles. Thus they are ideal for gaming monitors. IPS panels offer the best color accuracy and widest viewing angles but suffer to some extent when it comes to contrast levels. VA panels fall right between the two, offering better color accuracy and viewing angles than TN panels, but fall behind IPS panels in these. They, however, offer better contrast when compared to IPS and TN panels. Some further suffer from purple ghosting. Thanks to the SPVA (Super Patterned Vertical Alignment) panel, color accuracy is quite good, viewing angles are wide (178˚ vertical and 178˚ horizontal). Contrast levels are also very impressive at 3000:1 compared to 1000:1 in most displays. That is in addition to the curved display, which adds to the experience. Out of the box, however, color is poor since it is preset at eco mode. With some little color calibration to suit your taste, you will be surprised how good things get. If you’re looking to replace your monitor setup or even make your first setup for watching movies and surfing the web, the Sceptre C278W-1920R is a great budget option that should be at the top of your list. At just over $150, it offers impressive performance, immersive viewing experience, and good image quality. Although you won’t be able to game with (lacks Adaptive Sync technology and at least 1 ms response time), it makes for a decent casual use monitor. For a budget price, you can have plenty of screen estate for your daily productivity work and entertainment. 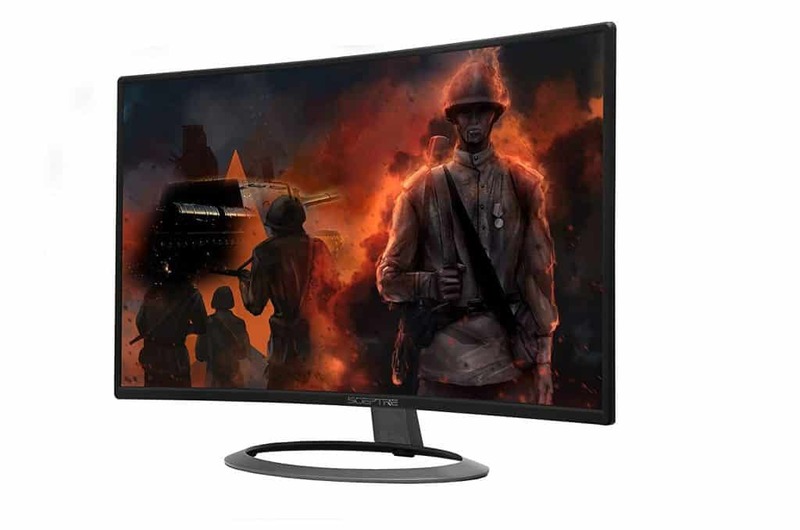 For avid gamers, considering the input lag and lack of gamer-centric features will likely disappoint, consider adding the Asus VG245H 24 inch Monitor to your shortlist instead.